I love mason bees, and have spent much time observing the red mason bees (Osmia bicornis) in my garden. I have captured quite a lot of video footage, including footage of the bees mating, and females emerging from the nest. I share one such video below. 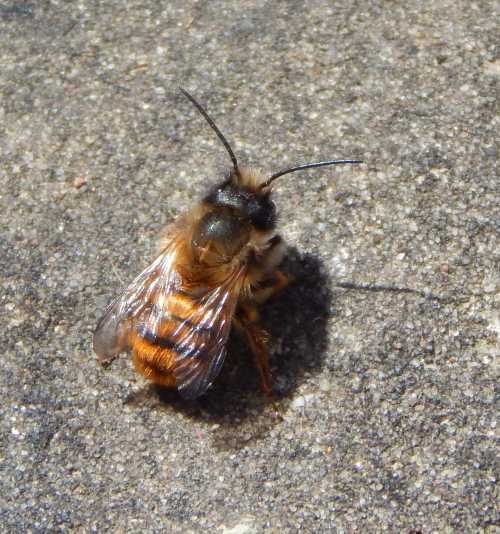 Mason bees are so-called, because they commonly use mud in the construction of their nests, however, it is actually the common substitute name used to describe bees belonging to the genus ‘Osmia’ which are part of the family ‘megachilidae’. Osmia means 'odor', and actually refers to a faint lemony scent used by these bees to mark their nest entrances. It is believed that each individual Osmia produces a unique scent of its own! Why? 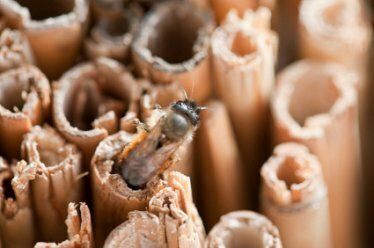 In an experiment using straw nest inserts inside a block of wood, it was found that once bees had begun building nest cells inside the straws, each individual bee correctly located her own straw even when it was moved from its original place! Approximately 500 species of Osmia have been identified around the world, with more than 130 species found in the US and Canada - some of these species are found in vibrant colours, such as metallic blues and greens. 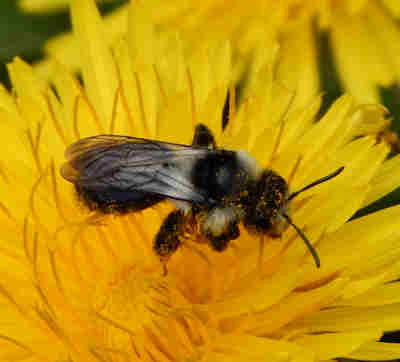 Mason bees are a solitary species and are non-aggressive. They are a friend to gardeners and farmers, and may be used alongside honey bees for pollinating crops. 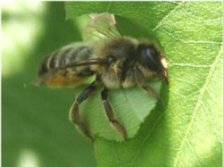 Similar to the leafcutter bee life cycle, adults emerge in spring following a period of development and hibernation in a cell. Males appear first, waiting eagerly for sight of the females with which they will mate. Below is a video taken of Red Mason Bee (Osmia bicornis - previously named Osmia rufa) activity around my own bee house. Males patrol and wait around the nest, watching, sometimes 'dive bombing' other males as they wait for the females to appear, whereupon they will pounce immediately and mate. Note males have a pale "moustache" or tuft of hair on their faces, and they are smaller than the darker-faced females. If you watch the video carefully, right at the very beginning you will notice to the top left, 2 males (note pale 'moustache') - one is inspecting the inside of one of the holes, checking for a female, whilst the other male can hardly get a look in! Watch as the female emerges, and quick as a flash, the male has caught her! Meanwhile to the top right, and on top of the bee house is an amorous pair, already mating for quite some time! With some bee species, the mating process is completed very quickly, but not with this species. As the camera moves to the hollow canes below you'll see a lovely female, with her sweet little face peeping out of her chosen cane! After mating has taken place, the males will soon die. The female will seek a suitable location for her nest. She then constructs the nest, providing pollen and nectar in each cell for a single larva. Eggs destined to become females are laid toward the back of the nest (as stated, they emerge after the males), whilst males are laid toward the front. They will usually make between 4 and 6 cells, although sometimes as many as 10. Four or five similar nests may be completed in a season. There will be one generation per year. 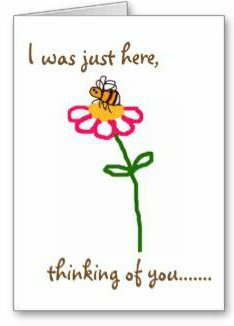 It may take many trips for bees to provide enough pollen for just one egg, and therefore, visits to many flowers are necessary. The larvae develop and pupate, emerging as adults the following Spring. Osmia are cavity nesting bees. The females make their nests in existing cracks and crevices in walls, but they also favour hollow plant stems, but some make use of empty snail shells! 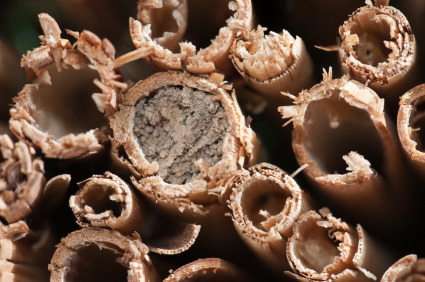 Mason bees may also take up residence in holes created by other wood-boring insects. They they are unlikely to cause any damage where their nests are made. Once a brood cell has been made, mud is often used (see image left) to make partitions between each individual cell and. The female uses a pair of ‘horns’ on her face to pack mud to close the cell. The mud they use may be gathered from the edge of a pond, or puddle from where they take small pellets to their nest. Mason bees are super efficient pollinators. Increasingly, as with bumblebees, mason bees are being reared commercially, especially for fruit crop pollination. Examples of species found in the Americas include the 'Orchard Mason Bee', Osmia lignaria - which has been found to significantly improve cherry crop yield, even greater than honey bee colonies (2), and the 'Blueberry Bee', Osmia ribifloris. There are perhaps a number of factors driving this trend, including concern about honey bee colony collapse and the need to reduce reliance on this species, and an increased appreciation of the role of wild pollinators. I'm all for the latter, but would issue a word of caution for the former: to simply replace one pollinator with another, without countering the issues causing decimation of honey bee colonies (such as insecticides like neonicotinoids) is merely an unsustainable, sticking plaster approach. I hope that in combination with an appreciation of wild pollinators, sweeping, genuine changes occur, to ensure a healthier environment for humans and biodiversity. For several years now, we have had the pleasure of watching these wonderful little pollinators establish nests around our garden, providing excellent entertainment! Below is a photograph taken of the bee house featured in the video. I received this bee house as a gift. You can also make your own bee house very easily! To encourage them to set up a home, site bundles of hollow canes or a log drilled with holes (do not use chemicals on the log), in a sunny position. Ensure the holes are around 1cm in diameter or a little less, and about 15cm long. Ideally, there will be a source of mud nearby, and plenty of opportunities for foraging. Please do not use plastic materials, glass or metal. Such materials can cause overheating, moisture, and related fungal and bacterial diseases, and ultimately death. Also, I advise against cedar wood - it has insect repellent properties. 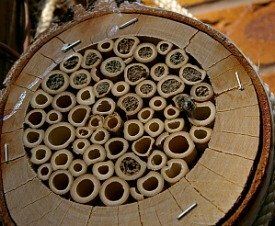 Some solitary bee houses are especially made to allow ease of cleaning, with replaceable carboard tubes. This is helpful because it helps to preserve hygiene and protect from mites (see below), which can be a problem for mason bees. The version right is probably one of my favourites on the market right now, but you'll need to keep replacing the tubes - it's available from Amazon (click on the image). 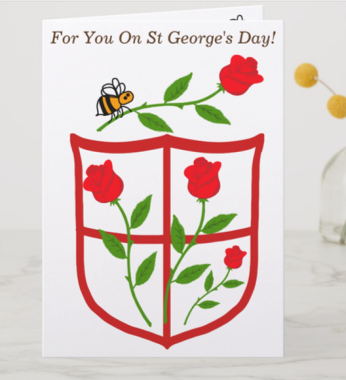 You will also find that some are designed to look attractive in the garden, and these do make nice gifts, but I recommend that you do not sacrifice a sturdy, quality build, and think about the bee's needs first. 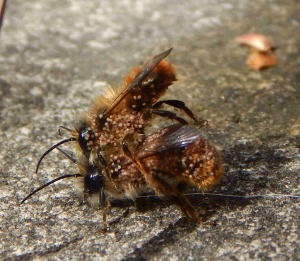 Above, Red mason bees mating, but unfortunately infested with mites. Pollen mites pass from bee to bee, dropping off onto flowers, hitching a lift on the next bee, and so being carried to different nest cells, where they breed and eat the bee larvae's food. It is also possible they eat the bee larvae itself. As mentioned above, you can make or purchase protective card inserts for use inside a mason bee house, and they are recommended, as they are shown to reduce pollen mite infestation. bee. Sustainable Agricultural Network, Beltsville Maryland. If you'd like to learn more about solitary bees, visit this page. Learn about some of the key differences between honey bees, solitary bees and bumblebees. Find out more about the types of bees, such as information about the different bee families. Take a look at these calendarized lists of plants for bees, including garden plants, herbs, wildflowers, shrubs and trees. Find out how the different types of bees are important for pollination. Found a bees nest and not sure what to do? Take a look at this simple Q&A. Bees are having a hard time. Here are 10 top tips to help save the bees - share them with your friends! Link back from Mason Bees to Home page.